Following the summer blowout that was the fifth Eastern Electrics festival, the brand now turns their attention to NYE to welcome 2017 in style with Richy Ahmed, Josh Butler and a Do Not Sleep takeover. 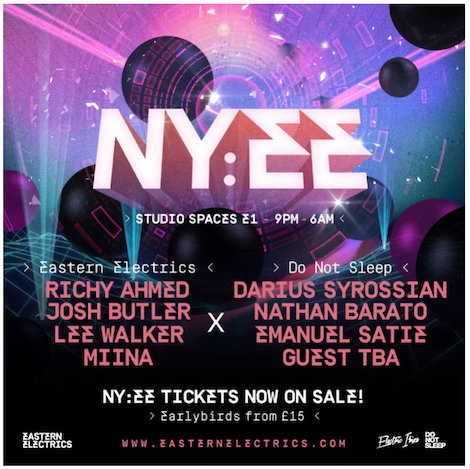 Descending upon East London’s rave spot Studio Spaces with two rooms from 9pm on 31 December and partying through until 6am, the EE crew are promising ‘a New Year’s to remember’, with tickets from just £15. Arguably their strongest edition to date, the fifth instalment of Eastern Electrics Festival apparently saw 17,000 party-goers dance across nine stages, and to round off what’s been a big year, they will once again ignite that euphoria in a special setting. NYEE will see Studio Spaces first room headlined by Richy Ahmed. Supporting him will be a spectrum of talent, with Josh Butler, Lee Walker, and Miina all on decks duties. The ‘DO NOT SLEEP’ room will see DJ, producer and label boss Darius Syrossian headline, bringing his Ibiza Space residency turned label over for a takeover including sets from Nathan Barato, Emanuel Satie and guests TBA.